The instant play action on the Bet-at-Home Casino has ensured that it has become a popular option since being launched back in 2005. This casino is licensed in Malta and despite being instant play the quality of the Net Ent games and the live dealer option make it well worth looking at even if you are as serious online player. In a world of glitzy, themed Internet casino sites this one is kind of underwhelming. It has an understated slightly retro look that you might love or might hate. What we can’t fault is the amount of information offered on the home page. Here, we can see the latest big winners, get instant attention from a customer service rep, see the current jackpot levels, check out the top games and choose between real money play and the just for fun option. Actually, after being initially put off by the appearance of the site we found that it grew on us and that we soon felt really comfortable and at home on the site. The fact that the Bet-at-Home Casino uses instant play Net Ent games means that the slots are top quality. 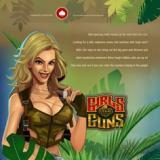 The list of slots titles on the site includes big names such as Dragon Island, Jack Hammer and Bloodsuckers. Another important feature of the site is the live casino option. This is where you can play live Roulette, Blackjack, Baccarat and Casino Hold Em in an exciting environment. There is a big selection of other casino games to sample here, from Scratch Cards to Video Poker and from Keno to Bingo. If you have never used an online casino before then this is an ideal place to try out a range of different games and see which ones are most to your taste. The first cash deposit you make to your new account will be topped up by 100%, which is a fairly standard type of casino promotion these days. The lack of other casino related bonuses is a trifle disappointing but it isn’t enough to put us off the site altogether. There are bonuses on the site for poker playing and for sports betting and if you plan to wager on a few different things you might find this a good place to do so. With so many of the current online casinos all looking and feeling quite similar it is very nice to come across one which seems really different. The layout of the Bet-at-Home Casino site definitely grew on us after a while. If you like the twin benefits of instant play games and an engrossing live dealer casino option then this is one site which you will want to have a look at before too long. GBP, USD, RAND, Kroner, Rubles and Swiss Francs. A good selection on on-going deals and offers are available to players.